Before you start eating this shrimp taco, politely apologize to your family that you’ll be unavailable for the next 15 minutes (5 minutes to wolf it down and 10 minutes of food coma). 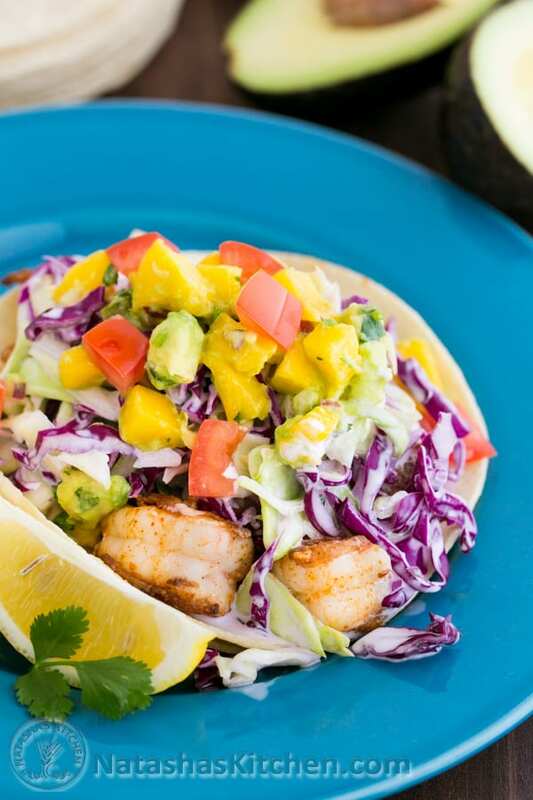 These Shrimp Tacos with Coconut Coleslaw & Mango Salsa are a yummy mouthful and you will not want to put them down. 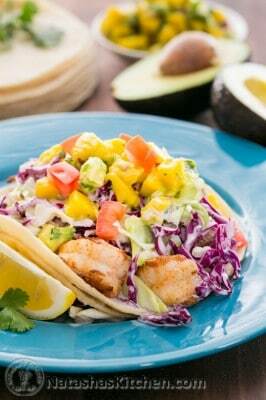 This was inspired by the famous fish tacos at Coconut’s Fish Cafe that we tried twice in Maui. 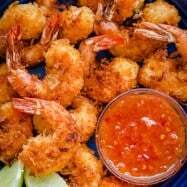 It’s a copycat recipe except for the shrimp part. Since it’s really hard to come by fresh Mahi and Ono in Idaho, we chose shrimp. To be honest, I think I loved the shrimp more; not a hint of fishiness and perfectly seasoned with a subtle spicy kick. Did I mention they are GLUTEN FREE? Those are white corn tortillas you’re seeing! My oh my these were bomb. 1. 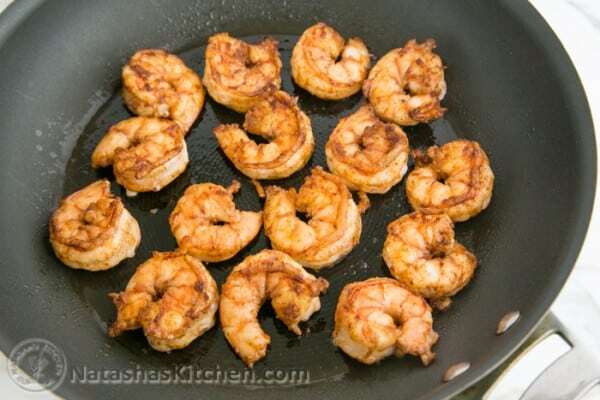 Combine 1/2 tsp chili powder, 1/2 tsp cayenne pepper, 1/2 tsp cumin and 1/2 tsp salt and sprinkle over shrimp. Stir shrimp to coat evenly. 2. Heat a large skillet over medium/high heat. Swirl in 1-2 Tbsp olive oil and saute about 1 min per side, or until pink and cooked through. Remove from pan and set aside. Once shrimp are cooled, chop into large pieces if desired (they’re easier to eat if chopped). Click here for the full recipe & tutorial. Don’t skip the coleslaw, ok? For goodness sake, DON’T! 1. 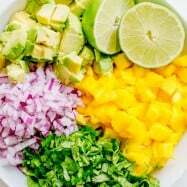 In a medium bowl, combine: diced red onion, 2 Tbsp jalapeños, 1/4 bunch chopped cilantro, diced mango and diced avocado then drizzle in 3 Tbsp fresh lemon juice and stir to combine. 1. When ready to serve, heat a medium skillet over medium heat and add 2 Tbsp olive oil. 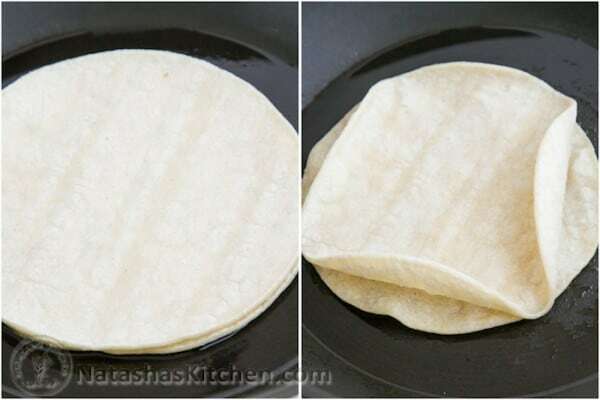 Stack 2 tortillas on top of each other and once the oil is hot, saute until the bottom is golden (no need to flip the tortillas). You’ll see the top one curl up; this is a good thing. The top one should be warm not toasted. Repeat with remaining tortillas. Add 1/6th of the coleslaw (it seems like a lot but you’ll thank me later), top with 1/6 of the mango salsa and finally stud the top with some freshly diced tomatoes. Put a wedge of lemon on each plate because they are even more amazing with a good squeeze of fresh lemon juice over the top. 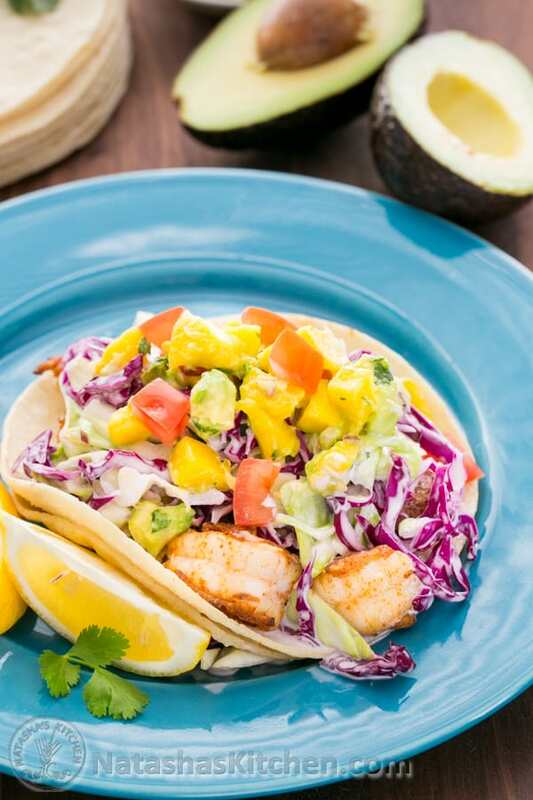 These fish tacos are a yummy mouthful and you won't be able to put them down. This was inspired by the famous fish tacos at Coconut's Fish Cafe that we tried twice in Maui. 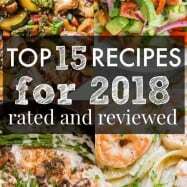 It's a copycat recipe except for the shrimp part. Since it's really hard to come by fresh Mahi and Ono in Idaho, we chose shrimp. To be honest, I think I loved the shrimp more; not a hint of fishiness and perfectly seasoned with a subtle spicy kick. This recipe makes 6 towering, juicy shrimp tacos. They aren't neat and tidy either; that's intentional! I like having a fork nearby to clean my plate once I'm done with my taco. 😉 Did I mention they are GLUTEN FREE? Those are white corn tortillas you're seeing! 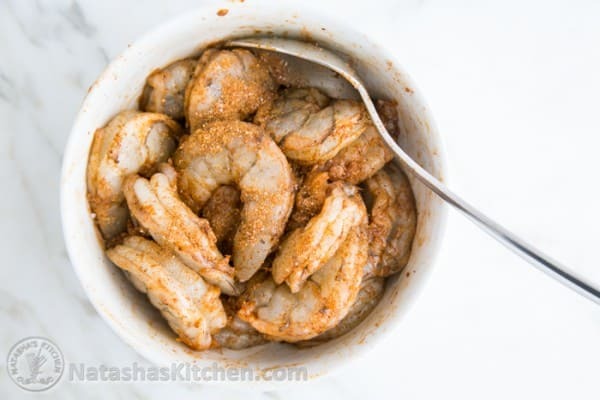 Combine 1/2 tsp chili powder, 1/2 tsp cayenne pepper, 1/2 tsp cumin and 1/2 tsp salt and sprinkle over shrimp. Stir shrimp to coat evenly. Heat a large skillet over medium/high heat. Swirl in 1-2 Tbsp olive oil and saute about 1 min per side, or until pink and cooked through. Remove from pan and set aside. Once shrimp are cooled, chop into large pieces if desired (they're easier to eat if chopped). Visit: https://natashaskitchen.com/2014/04/01/creamy-coconut-coleslaw-recipe/ for the full recipe & tutorial. 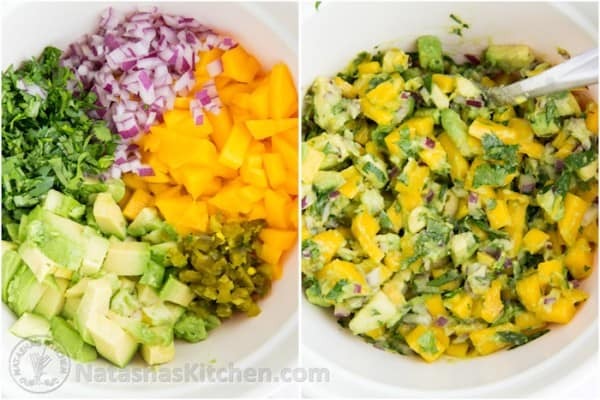 In a medium bowl, combine: diced red onion, 2 Tbsp jalapeños, 1/4 bunch chopped cilantro, diced mango and diced avocado then drizzle in 3 Tbsp fresh lemon juice and stir to combine. When ready to serve, heat a medium skillet over medium heat and add 2 Tbsp olive oil. Stack 2 tortillas on top of each other and once the oil is hot, saute until the bottom is golden (no need to flip the tortillas). You'll see the top one curl up; this is a good thing. The top one should be warm not toasted. Repeat with remaining tortillas. 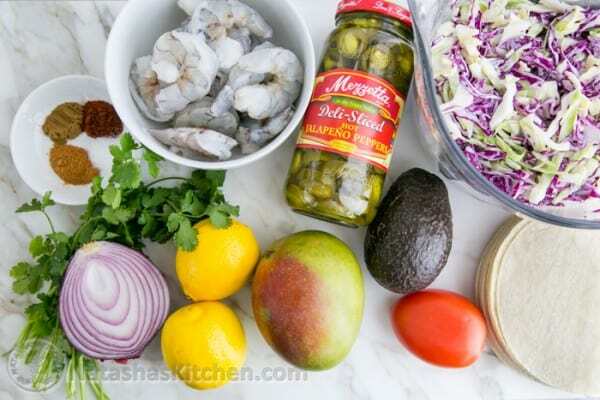 Place 1/6th of the shrimp on each taco (I like to make it an assembly line and have everyone make their own taco, that way I can focus on what's important; like eating my taco!) Add 1/6th of the coleslaw (it seems like a lot but you'll thank me later), top with 1/6 of the mango salsa and finally stud the top with some freshly diced tomatoes. Put a wedge of lemon on each plate because they are even more amazing with a good squeeze of fresh lemon juice over the top. I had lunch at coconuts twice. Was the best food on the Island and we ate at Mama’s too. 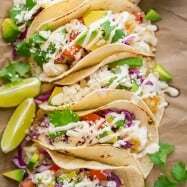 I live in Baja and tried to get them to give me the recipe because it was the best fish tacos I have ever had. 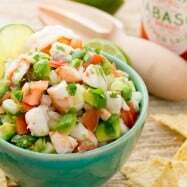 I sell fish tacos at my restaurant and that was the best ever. Try cooking your shrimp in coconut oil makes them all that much better. 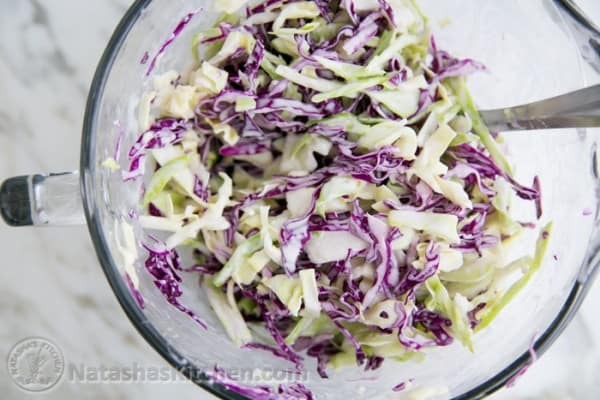 thanks you for you slaw recipe too. I could not remember what was in it beside coconut milk. best food ever. Wondering why you toast 2 tortillas at once on top of each other and load everyone onto 2…. I hate messy food. If I can’t look descent eating it, I don’t touch it. But THIS! this is something!! Summer on a plate! Something is going on with your site. The background is Tinkerbelle ?? Nice! Sponsorship from Disney, way to go girl!